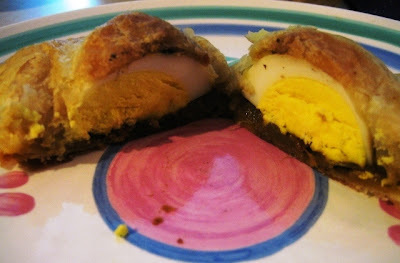 When I saw this Egg Puff recipe on Shyamala's blog I wanted to try it out immediately. 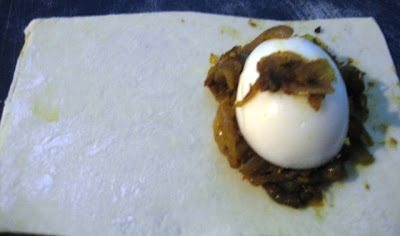 I loved the idea of having the eggs on a curried onion base and it was so simple to put together too. I normally only make a vegetable puff with the puff pastry sheets so this was a great alternative. I stuck to her recipe for most part and made some very slight changes. We thoroughly enjoyed this and have made it twice already. Thank you Shyam for a great recipe. I personally don't like the puff pastry sheets to be too thick.. I find it very buttery and flaky for my taste so I normally end up rolling it out thinner and make about 9 rectangles out of 1 sheet for this. So, my measurements below make 9 puffs. If you like the thick puffs, please use 2 sheets of puff pastry instead. 1) Heat the oil in a pan and add the sliced onions. Saute this for a few minutes with some salt. Let it brown a bit. 2) Then add all the masala powders and tomato puree. Cook this mixture for a few more minutes and adjust salt to taste. Finally add the chopped coriander leaves and remove from the stove. Allow this mixture to cool. Divide into 12 portions.. i had about a tbsp each. 3) Roll out the thawed puff pastry sheet, on a lightly floured surface, to desired thickness and cut them into 12 rectangles or squares (so you can form triangular puffs). 4) Place about 1 tbsp of the onion mixture in the middle and place a halved egg on top. Fold over and crimp the edges with a fork so they seal well. 5) Preheat the oven to 400 degrees F and pop these puffs in for about 10-15 minutes, or till golden brown. Let cool a bit before biting into them. Here's a cross-sectional view of the puffs. I would also like to send this as my entry for JFI-Onions hosted by Radhika of Radhi's Kitchen. Thank you Radhika for picking a very essential ingredient from my kitchen for JFI this time. Well now it is my turn to say i used to eath them a lot when i was in India. Mom never made at home but she always bought from the bakers. I am also going to try these. Yummy, love the idea of adding onions, I've made only the plain egg puffs here. Mine tends to become soggy after some time. Nevertheless, these are tasty. Nice one laav! I stuff i scrambelled eggs - make it spicy with onions & tomatoes.. or even joust panner crumbles with salt, pepper & spring onion, tastes great! thank you. i always hated the uber thick puff sheets. now i know how to fix it. Love Egg puff. Use to enjoy them when I was in Chennai from the Bakery stores.Thanx for inspiring me to try them at home. The puff halves look gr8. Perfect for a evening snack.. nice one. You reminded me of the veg/egg puff we used to eat in bakery. Lovely entry for JFI. Laavanya, thanks for checking on me n leaving a concerned message on my blog when I was away....wish u & ur family a very happy new year! I love puffs of all kinds. I have moved back to india and i have looked head and low of puff pastry sheets. But decided i make them on my own after i found a link to do it. Very complicated. Would you buy chance know of a good recipe, complication is not an issue, but a recipe from a good source will be nice. Thanks Asha. I don't eat meat so will have to pass on the beef willington... :) Waiting for your JFI-Kerala post. Thank you happy cook. Hope you do. Nammu, the onions give it a lovely flavour. Remya, i have had these very few times in india but liked these a lot when I made them now. Thanks. Rajitha, me too I sometimes get 16 puffs. Suganya, I didn't have that problem.. probably because the onions were sauteed really well. Seema, those are some lovely ideas. I've tried with paneer bhurji and like it a lot. Will try with scrambled eggs. Bee, yeah the experts say it shouldn't be touched thus, but I just can't eat it any other way. Thank you Rina. Do try them.. it's very easy to make. Sunita, thank you so much. Glad you like them. TBC, I don't like the ones in stores that overly flaky and buttery.. is that why you don't like them? Prema, thank you so much. Taste of Mysore, I remember those too. Thanks. Padma, good to see you again. Swaroopa... Thank you! Hope you give it a shot. Happy New year to you too. love the idea of whole egg!!! Yummm.....I just love egg puffs.My favourite at cinema halls in Bangalore ,since i never liked popcorn.Thanx for sharing. If I should choose one food to eat 365 days and still not be bored, then it would be egg puffs. I cannot eat this for a few more months. Still I will surely make this as soon as I reach my goal. Looks choooo yummy. am able to view your blog after ages... I'll make curried egg buns I think... what say?? will check all the posts I've missed so far!! Fantastic web site, I hadn't come across cookerycorner.blogspot.com previously in my searches! This is a message for the webmaster/admin here at cookerycorner.blogspot.com. May I use part of the information from your post above if I give a backlink back to your site?